This pressure relief cushion uses molded high density pressure sensitive foam to relieve painful pressure points aiding in the prevention and treatment of decubitus ulcers. Molded high density foams typically last longer than standard polyurethane foams, preserving the integrity of the cushion producing a high quality support surface. Specially molded leg troughs provide proper alignment and postural symmetry. The cover is low shear, water proof and is removable and washable. Available in multiple sizes to accommodate all patients. Leg troughs promote thigh alignment and postural symmetry. Raised front ridge controls sliding. 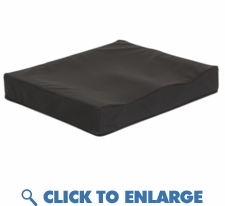 Low shear stretch nylon cover.